Unlike women that own tens of shoes, 100s sometimes–men are a bit conservative because they get the shoes that are more versatile. You’re often judged at first meeting by your hair, handshake and footwear. Shoes play a huge role in getting respected. However, there’s so much to choose from, so shopping for shoes could be overwhelming. Sneakers are really cool and are very important when it comes to making fashion statements. Nowadays, people pair it with different looks–from casual to traditional to even corporate. Subtle details—material, color, or type of laces—will set your sneakers apart from the next person and also decide what looks appropriate on it. The brogue is like a gift to man, think of the business casual shoe as a step up from a sneaker but not quite formal enough to be a dress brogue. It can be worn in many ways, even more than the sneaker. Add some variety to your wardrobe and try a lace-up and a loafer. 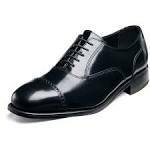 There is a reason it is called the dress shoe. You have attended enough owambes and business meetings to know that “dress to impress” means adding polish from head to toe. Speaking of polish, be sure to always complete your formal look with a shoe that’s clean and scuff free. Simple and classic, this shoe will get you to your event and back in style.